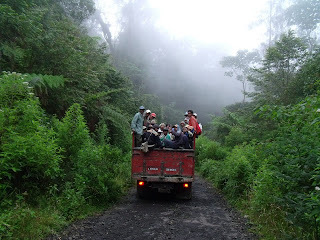 This is the best and safest way to get to Kawah Ijen, hiring a jeep with a driver is the best option. A driver has complete experiences and knowledge about the path to Kawah Ijen, so your safety will be his top priority. It is also possible to get to Kawah Ijen by motorbike, the road is good and always sign along the way up so you won't get lost anyway. Rent motorbike could be the cheapest way to get to Kawah Ijen but it has the biggest risk of accident. We do not recommend to ride motorbike for you who are not get used to ride for it. This could be an option for solo traveler, it is going by motorbike but someone will ride for you so it is more safe than self riding. Ojek to Kawah Ijen mostly cost IDR 250.000 / person (go and back). How To Arrange For It ? If you stay at Kampung Osing Inn, we can help you to arrange ojek to Kawah Ijen. We know some reliable and experienced ojek rider to take you to Kawah Ijen safely. Here we share our guest experienced who stay at our place, they want to go to Kawah Ijen by ordering Grab as that is the cheapest option IDR 185.000 / One Way. We tried to explained them clearly that Grab is not working to be applied to get to Kawah Ijen. The story continued, they booked Grab 12.30 am. Yes, the driver was coming in few minutes. But... He wanted to cancel the order because with IDR 185.000 would not covered operational cost and proposed a new price for about IDR 500.000 which was more expensive for only one way. They were arguing each other with no solution and it was already too late for us to arrange another jeep driver for them. So they paid for that amount because there is no other option in the middle of the night. It is not possible to book Grab / GoCar to go to Kawah Ijen for a fair price or same price showed on the mobile app. For adventure seekers, this could be the best option we could recommend. You can hitch hike this truck (usually used to transport workers and sulfur rocks), it leaves every day except friday in the morning at 6.00 AM from sulfur warehouse ( Address : Desa Tamansari, Licin). How Much Do We Pay ? There was no certain price to pay, just buy them cigarette maybe 2 packs to share with the workers on the truck and they will be very happy to invite you to join. It would be quite hard to get to the warehouse in time from the city center as there is no public transportation to get the area. Just find an accommodation nearby Tamansari or Licin area to make the plan easier. To get back from Kawah Ijen, you still can also go by this truck. It leaves back to warehouse with no fix time schedule, it leaves when the truck full load of sulfur. Want To Know More About How To Get There ?